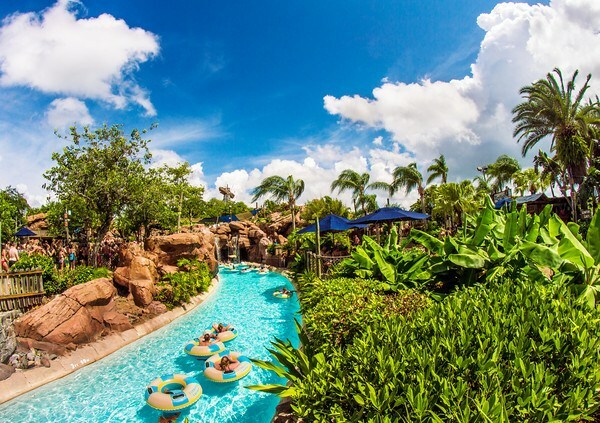 If you have a longer stay, are on a return visit or just LOVE water parks you may want to spend a day at one of Walt Disney World’s two amazing water parks. Both have family attractions, lazy rivers and kids play areas but if you only have time for one, how do you choose? Here are some things to think about… Theming Of course, Walt Disney World has the some of the best themed water parks in the world. If you are looking for a more traditional theme you should consider Typhoon Lagoon. It is the perfect tropical setting for your day in the water. Disney makes it special by adding a back story that the area has recently been hit by a typhoon that has left boats stranded, surfboards in trees and other interesting items out of place. If you are looking for something more creative Blizzard Beach’s theming is incredible. There was a freak snow storm in Florida and an enterprising gator decided to open a ski area, but the snow started to melt so he changed tactics and turned it into a water park. A Ski Lift brings you up to some of the tallest slides which resemble ski jumps. The piles of “snow” everywhere makes it clear that you are not at an ordinary water park. Kid Areas Both parks have great kids areas. Typhoon Lagoon has Ketchakiddee Creek for children under 48″ with slides, fountains and other activities for smaller children. They also have real sand areas for children to play in. Blizzard Beach has two areas, Tikes Peak and Ski Patrol Training Camp. Tike’s Peak is very similar to the kid’s area at Typhoon Lagoon with slides and fountains for preschoolers. It also has side by side slides for fun races! Ski Patrol Training Camp is designed for school aged children who are too big for the kid area but not quite ready for intense slides. With a zip line, climbing wall and other active fun this is a great area for kids to let off steam! Thrills If you are looking for the ultimate thrill you definitely want to head to Blizzard Beach. The Summit Plummet is terrifying. 12 stories STRAIGHT down… Typhoon Lagoon’s biggest thrill is the Humonga Kowabunga which is only 5 stories. Typhoon Lagoon does have an amazing wave pool with swells up to 6 feet. They offer surf lessons a few days of the week before the park opens… perfect for the adrenaline junkie. For something a little less intense but a whole lot of fun - Typhoon Lagoon has incredible water coasters that propel up and down the tubes with three different paths there is plenty to keep you busy! Scheduling If you visit during certain times of the year you may not be able to choose your water park. During the winter, one water park goes down for maintenance. If you have your heart set on one park or the other for your trip be sure to check the refurbishment schedule before you book your trip. If you are visiting in the winter, the parks sometimes close due to cold temperatures so I would recommend waiting to buy your water park ticket until you get there. Some Other Things to Think About Just like visiting the other Walt Disney World Theme Parks The first few hours and the last few hours that a water park is open are the best times to visit. The middle of the day is hot and very busy. The first few days of the week are usually the least busy days at the water parks. Don’t worry about bringing your camera. There are PhotoPass photographers in the water parks too. Their PhotoPass cards are attached to a plastic bracelet that you can wear while you're at the water parks. Or you could always use your magic band because they are waterproof!! If you are not staying on property you may want to consider purchasing a magic band for the charging capabilities so you don’t have to worry about carrying around cash or your credit cards in your bathing suit. Flip flops can not be worn on the water rides so you may want to think about water shoes. Also be sure to get some of the mini-donuts, at either park. They are delicious!!! All in all, I personally prefer the theming and shade of Typhoon Lagoon for a day in the water parks. There is so much for the whole family and if you are there for lunch their food options are much more creative and delicious. If you have younger kids, the different children’s play areas geared to the different age groups and the more gentle wave pool at Blizzard Beach makes it a much better choice! No matter what you decide you are going to have a great day at the water park! !